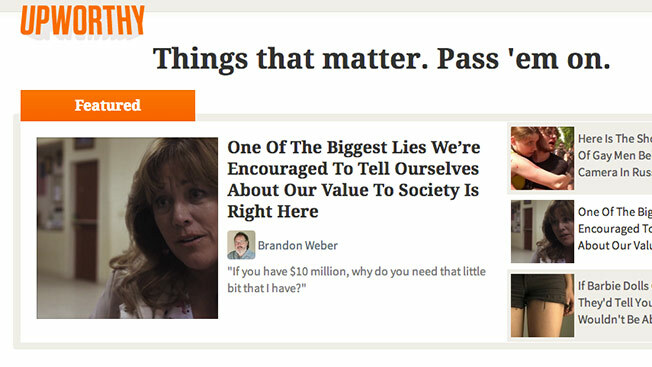 Upworthy, the social cause driven content upstart, says the page view is a lousy metric. It also believes that time spend doesn't cut it either when it comes to gauging success for a Web publisher. So the company is offering up something different: attention minutes. Going forward, Upworthy says it's going to track total attention on its site and total attention per piece. In a blog post, the company declared "If we’re trying to maximize attention for meaningful content, let’s actually solve for that." However, just how Upworthy plans to calculate total attention is a mystery—which could further cloud Web metrics rather than providing an alternative. According to the blog post, attention minutes is a "fine-grained, conservative measure of how long people are engaging with the content on our pages." The new metrics factors in when videos are playing, mouse movements, what browsers are open and other factors. Upworthy just isn't saying which factors are tracked exactly or how they are crunched together to come up with attention minutes. Rest assured, Upworthy has a lot of these minutes. During its last quarter, the company tracked 7 million attention minutes per day—or "13 years of attention, every day. We’re pretty proud of that." Upworthy co-founder Peter Koechley explained that the company's new formula tries to take into account how actively engaged a user is with content—an increasingly complicated challenge as more publishers churn out text, photo and video content—while discounting open browsers that sit ignored on desktops. "This is not out of left field," he said. "We have metrics now like time spent, and we think it works well for ecommerce but doesn't work as well for media and content. It's not terrible, it's just not really as fine grained. So we look for any signal that we think is meaningful. Mouse movement, clicks, any signal that people are still on page." Sounds great. But who says anybody in the industry is going to follow Upworthy's lead? Well, the company plans to release the source code so that any other publisher can implement total attention, if desired. Koechley acknowledged that the Web business can move slowly, but is banking on an overarching desire to track the effectiveness on online ads better. "If I'm an advertiser spending half a million dollars, need to find out that people aren't just letting a banner load," he said. So we just send a little ping every few seconds that essentially says, 'are you still there?'" We’re big believers that you are what you measure. Our mission here at Upworthy is to draw massive amounts of attention to the most important topics. So, how do you measure that? We dabbled with pageviews, but that’s a flimsy metric, as anyone who’s suffered through an online slideshow knows (20 pageviews! Zero user satisfaction!). Pageviews are only a great metric if you’re being paid for each pageview; we don’t run banner ads, so they’ve never meant as much to us. Unique visitors are fine but reward breadth over depth of user experience. Shares per piece of content are quite a valuable signal, but they don’t get you all the way there. And time on site, as Google measures it, works great for e-commerce but is often confusingly broken for media companies. Google Analytics at one point had us at 21 minutes on site per visit on average; we’re good, but we know we’re not that good. So we decided we needed a new approach. If we’re trying to maximize attention for meaningful content, let’s actually solve for that. Total Attention on Site (per hour, day, week, month, whatever) — that tells us (like total uniques or total pageviews) how good a job Upworthy is doing overall at drawing attention to important topics.